A robust benefits package can be the difference between a talented superstar choosing to work with you versus a larger, more established competitor. 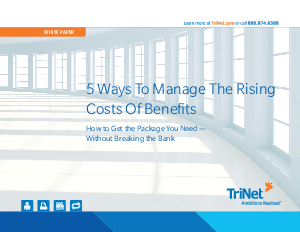 But with the cost of benefits rising each year, providing a benefits package that helps you attract, retain and motivate talented people gets harder all the time. With knowledge and planning, you can create a win-win situation for yourself and your employees. You can use benefits to meet the needs of your workforce and successfully compete for top talent. As a business owner, it's important to be aware of the ways you can manage costs and attract top hires.